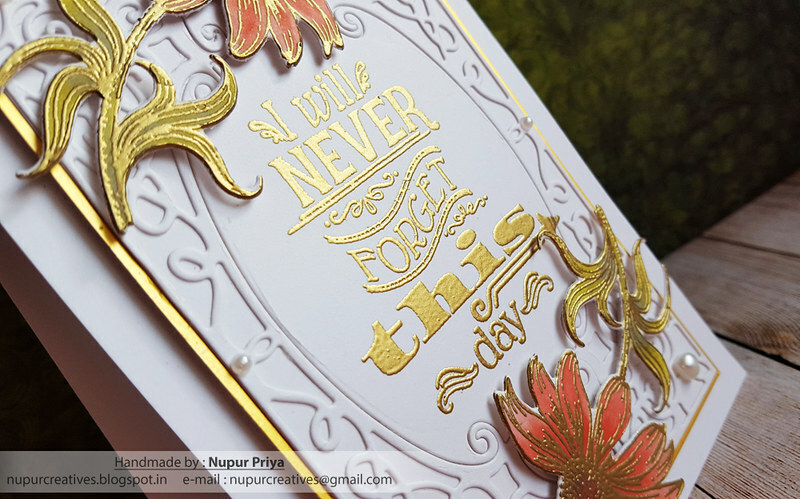 Distress Oxide inks give a beautiful velvety look and don't you just loved the results when it is paired with Gold!!! 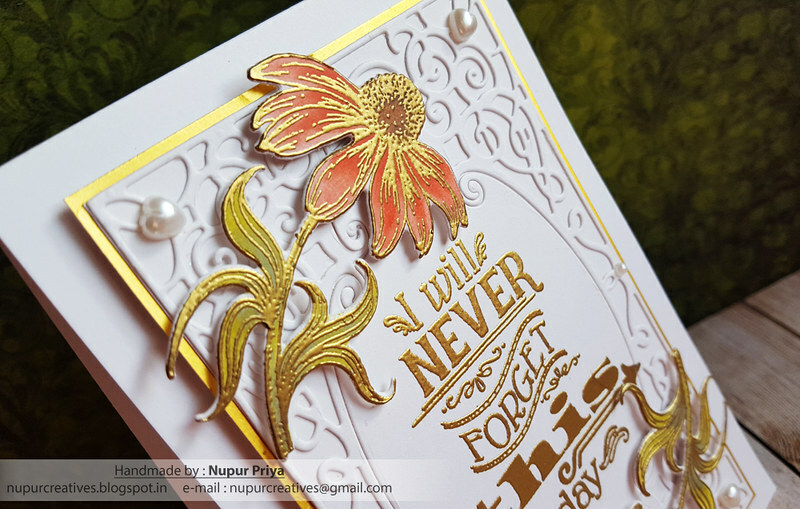 I wanted to make a simple and elegant card card with a rich look and so I decided to use Gold embossing for the images and colored them with Distress Oxide inks. Abandoned Coral, Candied Apple, Walnut Stain and Peeled Paint Distress Oxide Inks, Versamark Ink, Gold cardstock and pearls. Stamp the sentiment from Today's Quotes Stamp Set on a piece of white cardstock using Versamark Ink twice and heat emboss it using Gold Embossing Powder and Heat It Craft Tool. Die cut this piece using the die from Intricate Swirl Frames Die so that the sentiment is in the middle. Adhere it on a piece of same sized white cardstock as shown. glue it to a slightly larger piece of gold cardstock. Glue down this panel on a 4" x 6" white cardbase using Darice Adhesive Foam Strips. 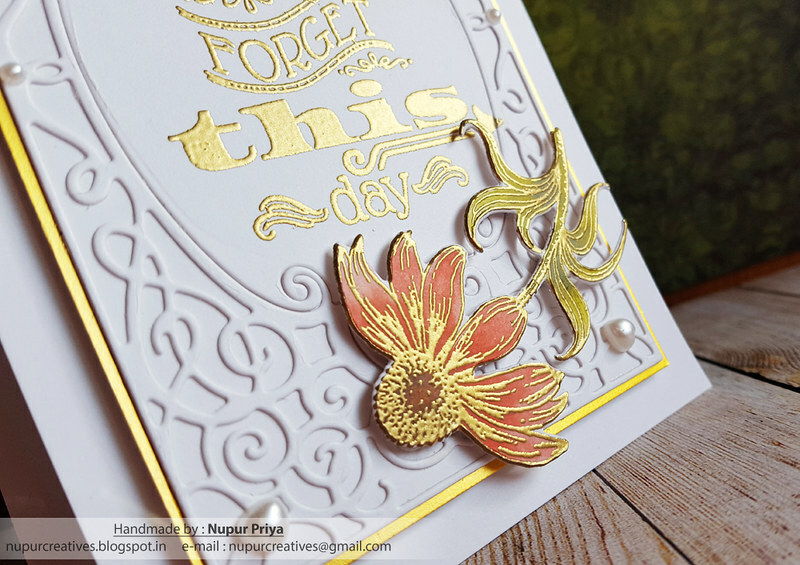 Stamp the image from Garden's Edge Coneflower Cling Stamp Set on a piece of white cardstock using Versamark ink twice & heat emboss it using Gold Embossing Powder and Heat It Craft Tool. Color it using Abandoned Coral, Candied Apple, Walnut Stain and Peeled Paint Distress Oxide Inks and Fantastix Blending Tool. 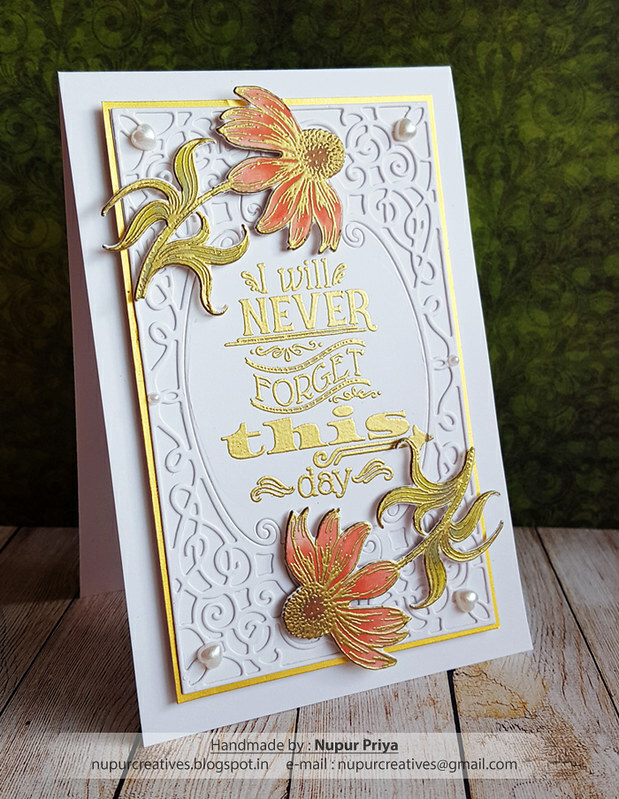 Die cut them using the matching die from Garden's Edge Coneflower Die. Adhere it to the card front as shown using Darice Adhesive Foam Strips. Add some pearls to add finishing touches.